When you get a debit card that is designed for businesses, it can help to improve your expense management and reduce your losses. You might find it easier to qualify for business debit cards than credit cards. For example, small businesses with revenues of less than $100,000 per year and new companies that have been open for less than five years may have trouble securing credit cards. The Federal Reserve’s 2017 Small Business Credit Survey found that 61 percent of micro firms and 70 percent of new businesses did not receive the financing that they had applied for. 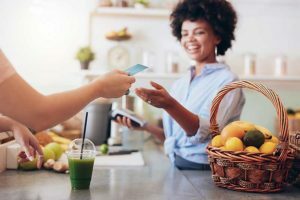 If you get a debit card that is right for your business, it can help to keep your business expenses separate from your personal expenses while helping you to track the spending that occurs. How can I get a debit card for my business? To get a debit card for your business, you can research different offers online and apply for the card that offers the best features. 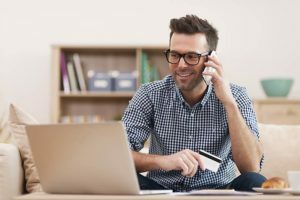 While there are many debit cards available, trying to find a debit card that fits your business’s unique needs can be difficult. You can read reviews online from trusted sources such as Forbes. You should choose a card that has earned excellent reviews from card users and from reputable sites such as Capterra or TrustPilot. For example, the Bento for Business Visa debit card has been profiled in multiple national publications such as the Wall Street Journal and Forbes and has earned top-flight reviews on both TrustPilot and Capterra for its expense management features. Whether you should try to get a debit card or a credit card for your business depends on your company and your needs. If you are averse to debt, a debit card may be a better option. New companies and smaller companies might also find that having a debit card is a better option because of the ability to control and manage employee spending. Businesses that are established and that are larger may have an easier time getting approved for credit cards. However, it is important for businesses that get credit cards to make certain that they pay their balances in full each month so that they are not assessed interest. Since business credit cards may not allow you to restrict the venue and amounts that your employees can spend, you should be very cautious in who you give access to your card and pay careful attention to the expenditures that are made with it. How is getting a prepaid card similar to when you get a debit card? Another option for businesses is to get a prepaid card. Like debit cards, prepaid cards do not add to your debt and instead allow you to spend your own money. Prepaid cards can be purchased in different amounts, allowing your employees to spend what is available on the cards that you give to them for needed purchases. Debit cards are linked to your account, and you can choose how much to make available on each card. When your employees use the cards, they are spending your money instead of adding to your company’s debt. Debit cards and prepaid cards also do not charge interest on the balances that you have on your cards because it is your own money. If you have decided to get a debit card for your business, you might discover that finding the right card can be difficult. You should look for a card that offers you more features beyond simply being linked to your account. A good card should have strong security measures such as 256-bit SSL encryption. Your deposits should be FDIC-insured to give you additional protection. 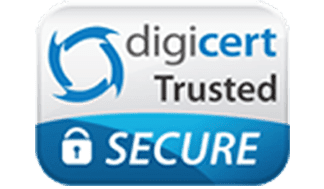 Great debit cards for business will have strong security measures combined with some additional features to help you to control and manage your expenses. Ideally, you should look for a card that lets you restrict when it can be used, how much can be spent, and where it can be used. 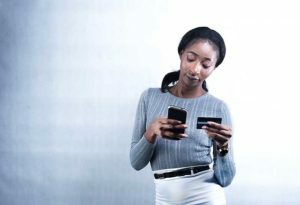 The ability to turn off a card remotely at any time and being able to see transaction data in real time are other features to look for in business debit cards. When is it a good idea to get a debit card? If you are wondering whether it is a good idea to get a debit card, you should consider a few factors. Debit cards for business can be used to help you to keep your business and personal expenses separated. This is important to help you at tax time and also to prevent you from accidentally opening yourself up to liability. If you also want a better method of tracking your expenses, using debit cards instead of paper-based systems is also helpful. You can give cards to your employees to use and track the spending by each employee. If your company has several departments, you can assign a card to each department and track spending in that manner. Using debit cards at your business can help you to reduce your spending. You can get rid of outdated reimbursement processes, which require additional time and labor costs because of the need to audit the request forms. Using cashless systems of payment can also help you to reduce waste and to see exactly how your money is being spent. Without good tracking in place, it is easy for your expenses to balloon. Using debit cards can help you to get a better handle on your budget and allow you to see where adjustments might be needed. Using prepaid cards at your business can also help to lessen your risk of fraud. Since prepaid cards are not linked directly to your accounts, potential thieves can’t access your accounts by stealing the card numbers. Prepaid cards can also help you to prevent internal fraud. By giving your employees cards to use to make purchases, you can get rid of petty cash funds and the need for check writing. You can also limit how much is available on each card and compare the balance to the transactions that are made. Expense management refers to all of the processes and policies that your company has in place to manage your employee expenses. While prepaid cards can help to prevent fraud, business debit cards can give you even more help with your company’s expense management. 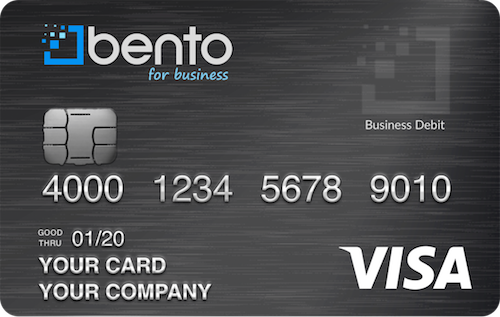 For example, the Bento for Business Visa cards allow you to see the transaction data for each card in real time. You can log into your dashboard and see your card balances and what has been purchased by each employee. The cards can be integrated with your bookkeeping software so that the data uploads into your program automatically. Finally, your employees can take pictures of their receipts so that they are attached to the transaction information. Bento for Business was founded by professionals from the financial industry with the goal of offering debit cards for businesses that help to control and manage expenses. Funds that are held within Bento for Business are insured by the FDIC for up to $250,000 through the Bancorp Bank; Member FDIC. People are not charged interest or high annual fees, and there are affordable packages to fit businesses of any size. Bento offers a free 60-day trial for companies that want to try out the cards. You can also request a demo or call 866.220.8455 to learn more.